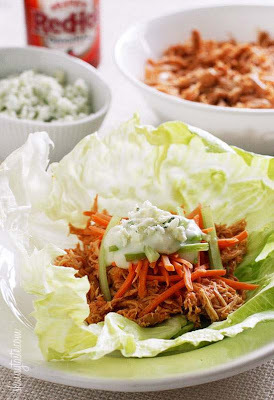 Buffalo Chicken Lettuce Wraps have all the flavors of Buffalo Chicken in a lettuce wrap! Just choose whether you want to use the slow cooker or the Instant Pot; this recipe has instructions for both. Click here to see The BEST 5 Ingredients or Less Instant Pot Recipes! I’m thinking that anyone who loves Buffalo Wings but wants a healthier option is going to love this idea for Slow Cooker or Instant PotBuffalo Chicken Lettuce Wraps from Skinnytaste. The recipe starts with boneless, skinless chicken breasts cooked in the slow cooker or the Instant Pot with chicken broth and hot sauce and some seasonings, and then the spicy chicken is shredded and served in lettuce cups with celery and carrot slivers and some blue cheese or ranch dressing. And if you’d like to make this even lower in carbs, just omit the carrots. Yes, I am drooling. Do you like this idea for an easy and healthy dinner? Get the complete recipe for Slow Cooker or Instant Pot Buffalo Chicken Lettuce Wraps from Skinnytaste. You can make Slow Cooker or Instant Pot Buffalo Chicken Lettuce Wraps in any Six Quart Instant Pot, or a 4 Quart Slow Cooker (or larger) would also work. 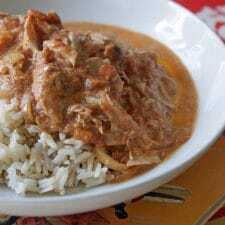 Use the Index Page for Chicken to see all the Slow Cooker or Pressure Cooker Chicken Recipes that have been featured on this site! Three Recipes for Chicken Adobo You Must Try! Thanks for the feature Kalyn!! Gina, my pleasure. This looks like an amazing recipe!